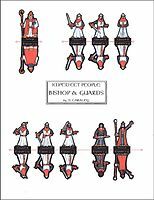 This next set includes a Bishop or High Priest, a Priest, a Captain of the Church (or Temple) Guard, and a set of Church (or Temple) Guards. Hope you find them useful. You think a lot like my Husband, he was planning on doing these too --- as well as the Arabian set. How very curious! My wife noticed that I think like Jabbro and Jim too. It seemed everytime I was working on a project (tavern folk, Demons...) someone else would release them in the middle of my making them. I am begining to run out of already created figures (I still have Northmen and a few Giants to clean up and lay out) and will get back to making new designs (Raiders from the Steppes - Mongol type warriors). Oh, and I hope you liked my attempt at camels now posted with my Desert Folk. 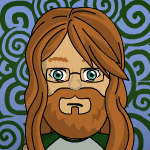 My thanks to you once again, Sir Rob. No problem Dryw, you've done all the hard work drawing them adding the cut files is a piece of cake in comparison .